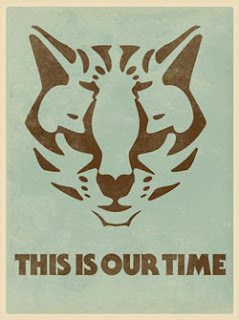 The sounds of a jungle cat revolution. "Wildlife in the region rely on open corridors and do not recognize human generated boundaries..."
BTC - Unless you are really really sensitive to any relationship between Real ID and the border fence ecology you may have wondered about the whole "ocelot" avatar association on my twitterfeed. It's the only place I didn't add the circle-slash on RFID icon. Most of the REDUX blog entries come as a comprehensive overture from tweets; which topped 1,000 today with CEI's arguments on Arizona's SB 1070. It's still more in number than the public comments on the NSTIC forum. 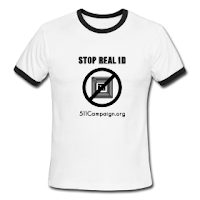 There is yet another layer and another dimension to the injustice of the Real ID Act. "U.S. border policy dramatically changed in 2005 with the passage of the REAL ID Act. Section 102 of this legislation gives the Department of Homeland Security the unprecedented power to waive in their entirety all local, state and federal laws that might interfere with the construction of infrastructure along the borders, including landmark laws enacted to protect the environment, historical sites and public health and safety. " In earlier assertions, the powers reserved to borders states are still relevant until it you hit the border wall. Pygmy owls, toads, black tailed prairie dogs, jaguars, and ocelots can't overcome the border fence. Meanwhile, a clever Mexican can jump it with the help of a coyote. 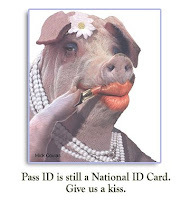 Rep. Grijalva (D-AZ) wants to push forward with a legislation called the CIR ASAP, which would strip out section 102 C of the Real ID Act; which erects the useless, destructive and lazy excuse for border protection known as the border wall fence. Comprehensive Immigration Reform right now is still in the idea phase and what's currently dangerous about it is that they want to give every American worker a biometric identity card - which is not an improvement from the Real ID Act. To prevent further degradation, it is imperative that any immigration bill that passes repeals section 102 of the REAL ID Act, restores the precious ecosystems throughout the borderlands and replaces the current strategy with one based on comprehensive analyses and consultation. BTC- While there are many who express disgust with the public transit system, I feel it's something I can live with until an electric car is ready. In recent past I've discovered public transit is partial to public surveillance theatre and special pre-recorded reminders about watching for suspicious packages. However, nothing topped the TransitWatch pamphlet I picked up today, complete with the "watchful eye" logo on it. Blame my hypervigilance on the emergent ghosts of Kafka or today's quest to afflict John Yoo... but all of it was so telling that I was in the right vein of conscientious objection when I saw the following text inside the transit lit. Visible signs of nervousness [What does one man's nervousness look like to another? None of these descriptions have anything to do with an actual crime being committed, but if your neighbor doesn't like your clothes or the fact that you broke a sweat trying to make the train on time - you might be soon be a terror watch subject. This message was brought to you in part by a system that has been in place since 2003, based on a UK public surveillance policy of "reasonable indication" and these fine folks. BTC - Few organizations have been ready to go out on a limb with analysis of the National Strategy for Trusted Identity in Cyberspace. The Electronic Frontier Foundation, was one of the first digital watchdogs to start barking at the US government's ambitious plans to import itself into the transactional living of a nation. BTC - Biggest break in transparency reports from mainstream media come from the Washington Post. Special thanks, lead tip goes to Christina Zaba. WaPo laid out a "rainbow" of where your tax money goes when it comes to programs shrouded in secrecy in their TOP SECRET AMERICA investigative project series. More from driver, Howard A. Schmidt here. DEFCON: Cyber "warfare" panel in all of it's foulmouthed beer drinking glo-rayy here. The timeframe for public input on an online national identity system expired Monday with less than 1,000 comments on the National Strategy for Trusted Identity in Cyberspace or NSTIC. The White House sought public input during a 3 week timeframe on a high concept strategy to increase cyber security. The public comment was hosted online and moderated under the seal of the Department of Homeland Security. NSTIC would create a new national identity “ecosystem” for online users in America. Since that time, coalitions are forming and organizing around the dispensation of public interest in the program in an effort to ask the White House and Congress for more time to evaluate the impact of the program. “There’s a lot to consider with this program. It’s scope, cost and effects on the public are largely unknowns. We need more time to gauge the impact of how the program will affect privacy and identity,” said Sheila Dean, an organizer for the anti-national ID coalition. Privacy and identity coalitions, like the anti-national ID coalition, are working to increase dialogue. Each of their organizations will be a part of an open letter to the White House about the new proposal for an online identity system, requesting an additional 90 days to evaluate the program. Details about the technical structure and commercial contractors were difficult to pin down from a 36 page conceptual schematic issued under the DHS agency. There was clear intent from the proposal to sell the adoption of the strategy to businesses and to encourage successive adoption by consumers. Little concrete or detailed information was available about costs, impacts to public safety, privacy and civil liberty and other ranges of concerns applied to public efficacy on the proposal’s application. With so many unknowns, more and more questions are turning up among advocates and legal professionals who won’t be able to take a position on the national identity program without more information becoming available. BTC - It's finally happened. Beat The Chip cannot possibly contain the news downpour coming from the havoc wreaked by our monster government. After doing this blog for over two years, I've broken down and decided to introduce another blog. Godzilla Government is meant for the overflow of news to contain the ongoing political freak fest complete with miserable exploding pundits and the flopping and gasping of politicians in the evaporating shallows and the wreckage of what we get to live with. Every revolution starts with a song and dance, listen here. This is all the introduction the overflow blog is going to get. Welcome to the gate of Godzilla Government.